Despite sitting only a half-mile from the ocean, Brian and Susan’s beach house didn’t look beachy at all. Its natural charm was hidden behind an overgrown yard, dark colors and heavy furnishings. 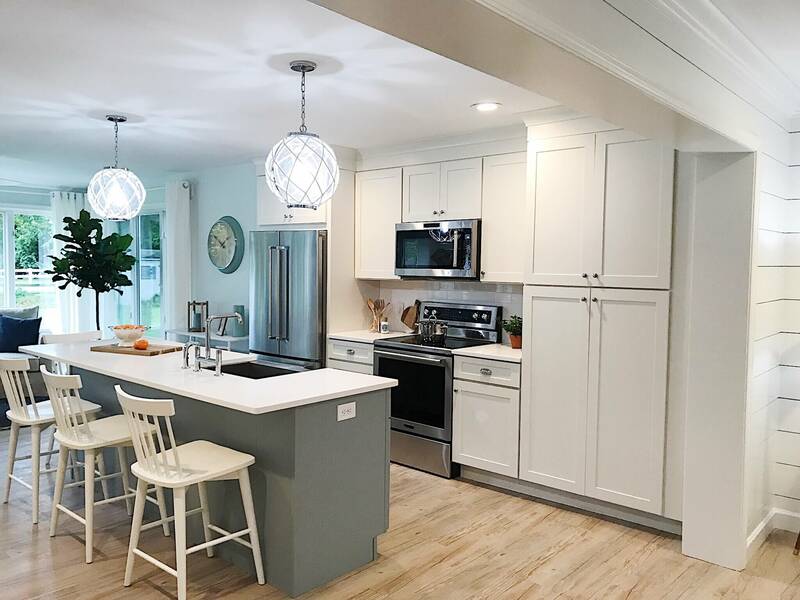 This third-generation family home in Bethany Beach, Delaware, where Brian’s parents had lived full-time for many years, held meaningful history – but it hadn’t been updated since 1986. 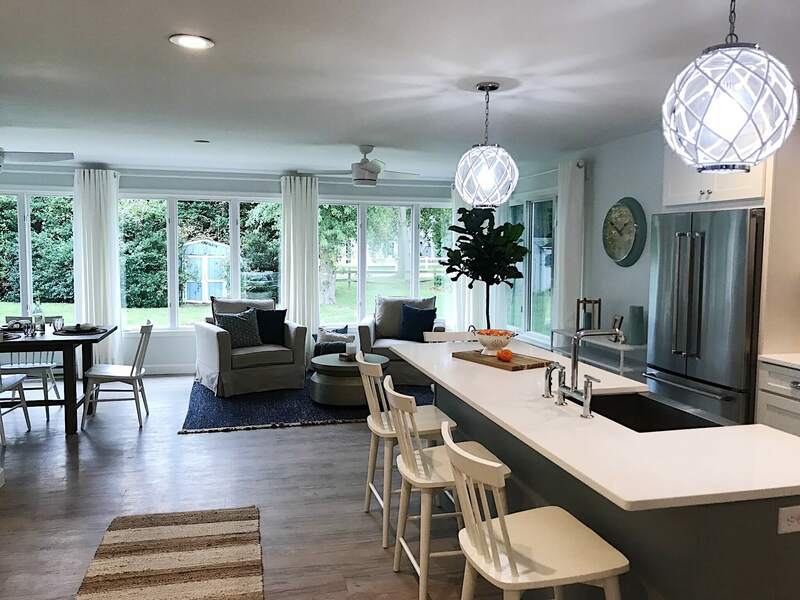 Now that Brian had inherited the house, he and Susan aspired to modernize and personalize it to create a place their two teenagers, Rebecca and Mason, would enjoy spending time with the family. 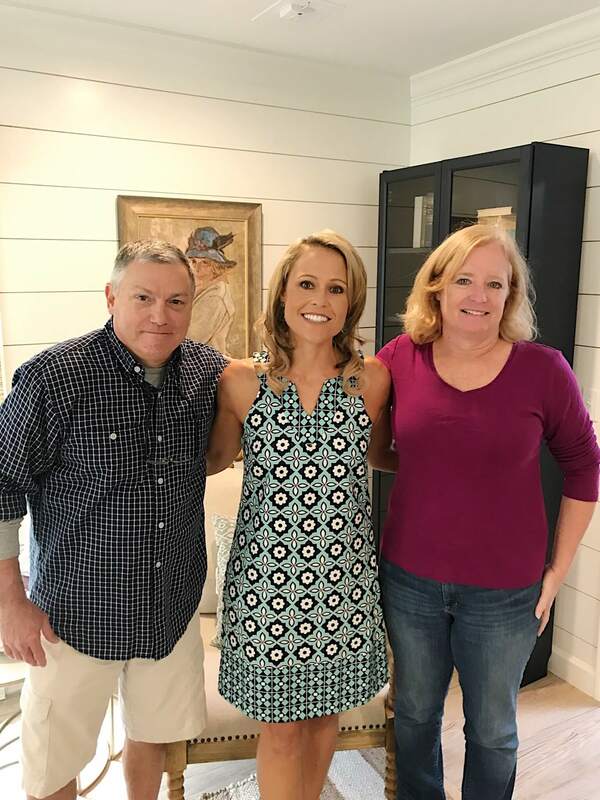 I was thrilled to work with Brian and Susan to find a balance between honoring their family history, and giving the home new life for future generations. Problem: You would never know that a lovely Cape Cod-style home was tucked away behind these tall hedges and unassuming front yard. The house’s exterior needed a little more pizzazz to enhance its classic architectural features and boost its curb appeal. 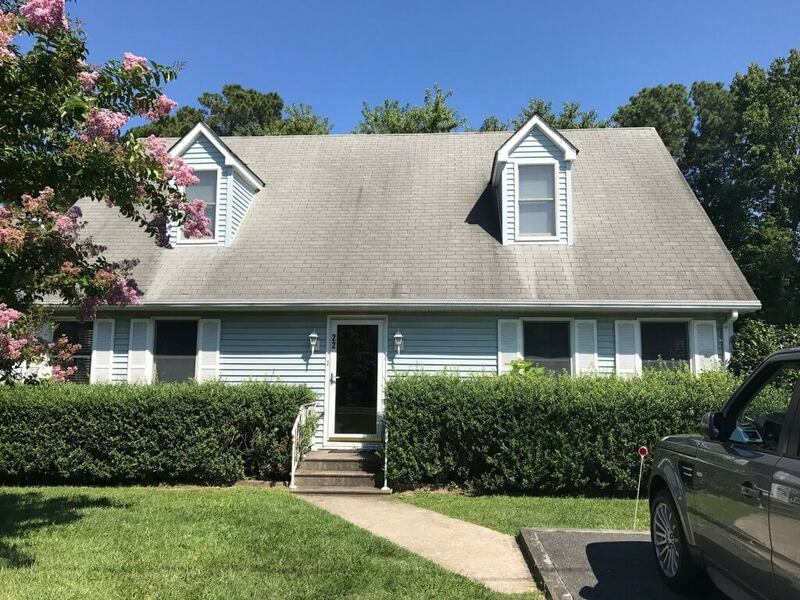 Solution: To give the outside of the house a more eye-catching look, I built a custom arched portico with an expanded landing, and added new 8-inch white lap siding, black shutters and a beautiful red front door. I also trimmed the front hedges, and upgraded the nondescript walkway with natural cleft bluestone in a French pattern. 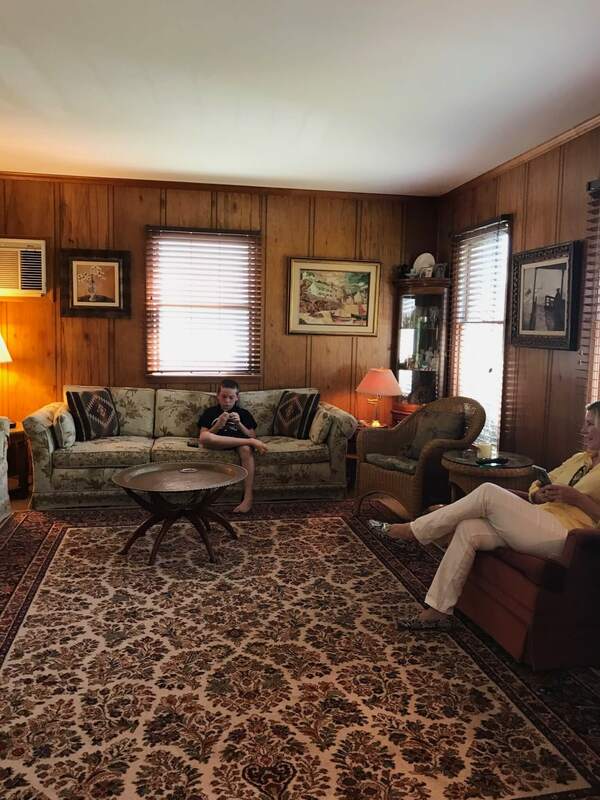 Problem: While a living room with dark wood paneling and overstuffed sofas might have been cozy a few decades ago, it now felt old-fashioned and gloomy. Brian and Susan wanted a brighter, cheerier space suited for entertaining and hanging out as a family. 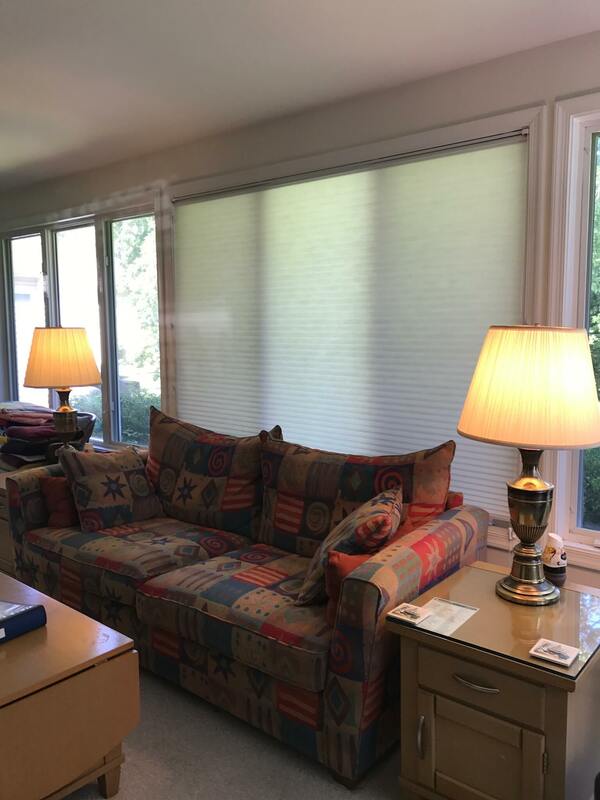 Solution: I incorporated lighter colors and furnishings to open up the space and refresh the look. 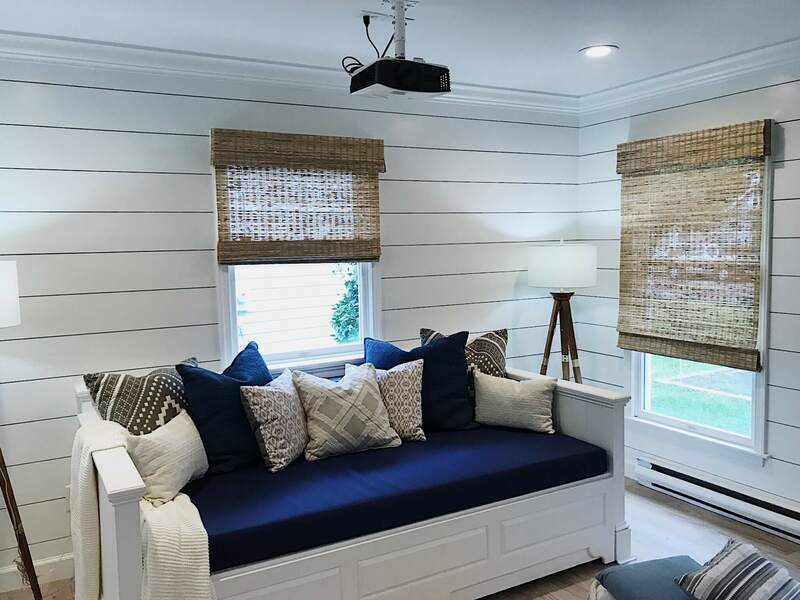 I replaced the flooring, and traded the wood paneling for shiplap walls to convey a relaxed beach cottage charm. To honor Brian’s family history, I framed and hung a few pieces of his father’s artwork on the walls. The old living room had been too dim, so I focused attention on the window in the center of the room. I removed the old blinds blocking natural light from coming in, and placed a custom-built daybed in front of the window. The daybed is wide enough to provide seating for many people during social gatherings, but it also hides a trundle bed for extra overnight guests. But my favorite part of this room is a different secret feature: it transforms instantly for movie night! A video projector and screen pull down from the ceiling – a fun addition that is sure to be a hit with the whole family. 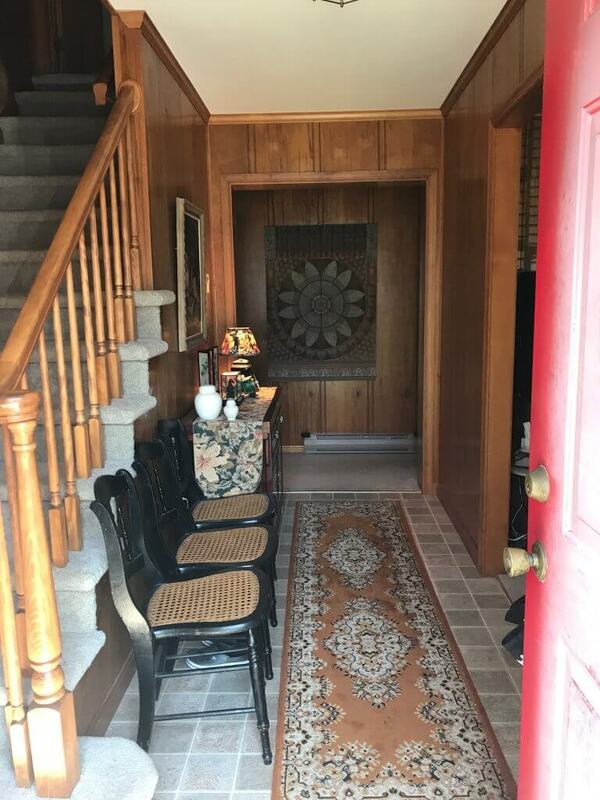 Problem: The main staircase was another artifact from the ‘80s, with more wood paneling and plush carpet stairs. No one had ever given it much thought, even though it was a primary focal point from the entryway. Solution: The staircase was an extension of the living room – not just a throwaway space. 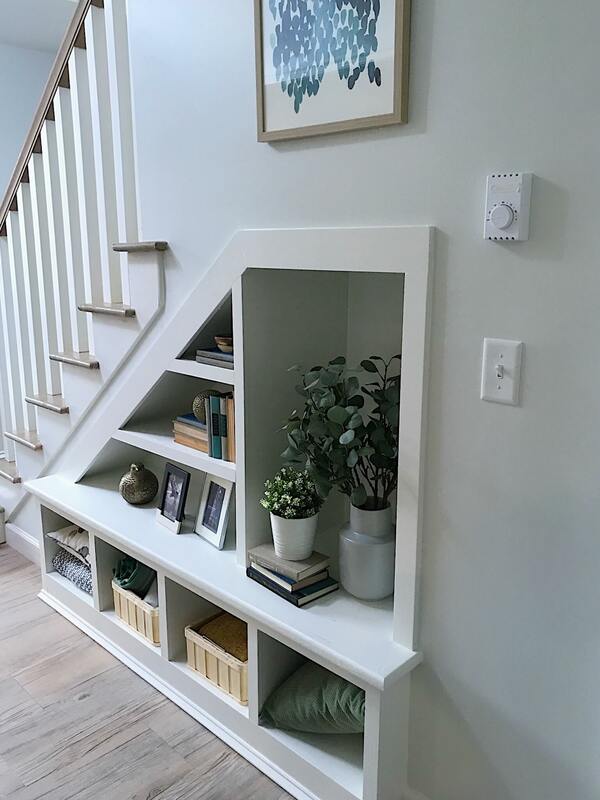 I made it both functional and attractive by building much-needed storage shelves under the stairs – ideal for beach bags and towels – and replacing the carpet with hard flooring. 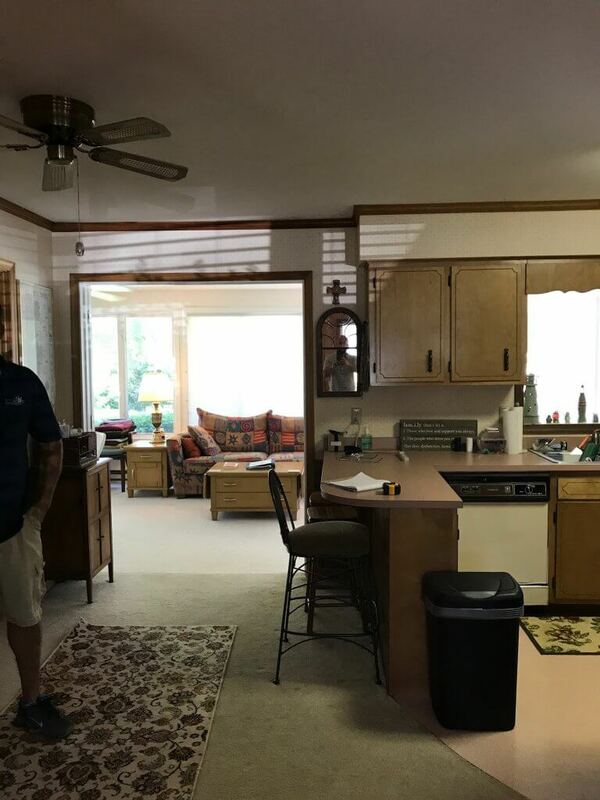 Problem: The cramped, dated kitchen had dark wood cabinets and tired flooring. But just beyond the kitchen wall was a beautiful sunroom addition with a lot of potential. Solution: I tore down the original exterior wall that separated the kitchen and the sunroom, creating an airy open kitchen and dining area. 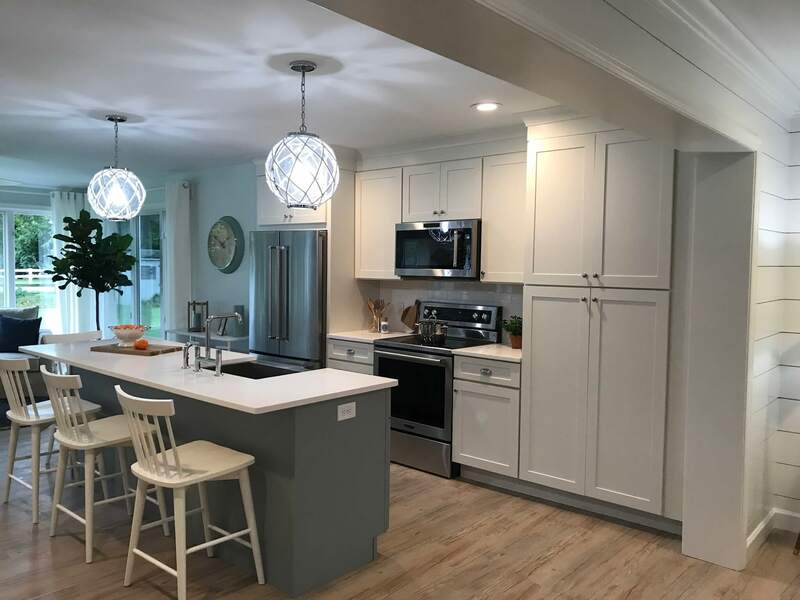 I installed all new appliances and fixtures, plus bright white cabinets, a kitchen island with a pop of accent color, and tall stools. The new space has a contemporary beachy atmosphere ­– sophisticated but still casual. Brian and Susan’s home now feels like the charming beach house they’ve always wanted. It integrates important pieces of their family’s past, while looking ahead to the future. Thank you so much for watching, sharing, tweeting, emailing, calling, texting, and supporting me in the million ways that you did. Learn more about the behind-the-scenes secrets on all my episode recaps. And tune in for two brand new episodes of #BigBeachBuilds every Monday night at 9/8c on DIY Network.